Q. Are you proud of the way you fought? RAFAEL NADAL: Well, I think I didn't play bad, no? But I think he played really good, really good match. I wasn't physically 100%, no? I had fever two days ago. Last night wasn't perfect, too. So I felt with less power than usual. I feel a little bit tired for the moments, and that's what happened in the second and in the third. I was 4-0, and with 4-0, I know that the match wasn't done. So it was important victory for me for the situation, because Lacko played, I think, very well, and I had to be there and fight all the time to win, so is important victory for me. Q. What did you tell yourself at the start of the third set? RAFAEL NADAL: Well, when I lost the serve for the second time in the second, I didn't fight anymore, because I say, Well, we gonna rest a little bit now and try my best in the third.I just know what I had to do to play a little bit better, no? I know I had to change the rhythm of the ball, play with a little bit more slice, with more topspin balls, high balls, and tried to change a little bit the rhythm, because he was touching the ball fantastic, and I didn't have enough power to have pain him with my shots, no? So I had to change a little bit and play a little bit more, with more strategy than usual. Q. Are you taking any medicine or seeing the doctor? RAFAEL NADAL: Well, sure, no? I am taking anti-inflammatories, I am taking antibiotics, and that's all that what can I -- I can, you know, how is the rules, and I can't take a lot of things, no? Q. Did you hesitate to play this morning? Did you hesitate to play this match? RAFAEL NADAL: No, no, no. I didn't consider that. I always know I gonna play, yeah. Q. And in doubles, too? RAFAEL NADAL: Yeah. Well, especially I know today, with all the respect, wasn't really difficult match in doubles, and maybe just be there and try to help a little bit my friend and play. And for me is good practice now. I know was a little bit tired for me after the tough match in singles going doubles. For that reason I go straight from the singles to the doubles and tried to play, focus on doubles. Worked well. We won. That's positive thing, and we are in semifinals in doubles. Happy for that. Right now tomorrow gonna be another day. That's still a good practice for me, play a lot of hours on court, because Australia is in one week and a half, and play long matches there, for sure, so that's good. Q. Do you think you will be able to be 100% tomorrow? RAFAEL NADAL: No. I think I gonna be a little bit tired, but I am here to try my best. For sure my goal is to try to win tomorrow and try to be at my 100%. Q. Almost the same thing you met today, for Federer met so many difficulties to win his match. What does this mean for the two best classified players compared to the others? Can we wait for something, for surprises? RAFAEL NADAL: We never won easy, never; not this year, not last year, not two years ago and not three, five years ago. The tour is very difficult. All the players are very competitive. They are very good professionals and very good tennis players, everybody here. You can lose and hope win against everybody. That's the sport, and I know when I go on court I can win and I can lose. For Roger I think is the same. Q. You don't feel privileged? You don't have feel you have privilege compared to the other players? RAFAEL NADAL: What kind of privilege? Q. That you are No. 1. 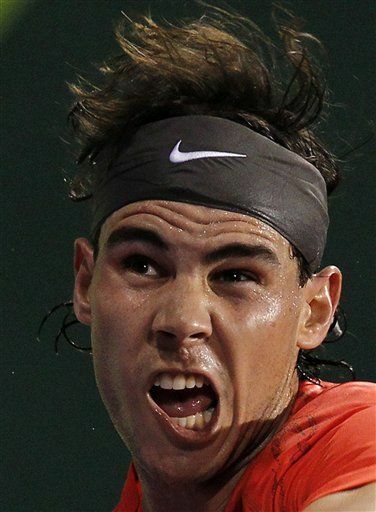 RAFAEL NADAL: Well, the ranking says I am the No. 1 now, but when you go on court, doesn't matter if you are No. 1 or No. 10. When you go on court, gonna win, the player who plays better that day. And if Lacko play better than me today, he will beat me anyway if he is the 50 and I am No. 1. When I am playing, I am not thinking if I am No. 1. I am thinking about try to play well and try to win the match. I think the opponent thinks the same.